Space shuttle Atlantis touches down at Edwards Air Force Base, Calif. This storywas updated at 5:43 p.m. EDT (2143 GMT). CAPECANAVERAL, Fla. -- Seven NASA astronauts and the shuttle Atlantis returnedsafely to Earth Friday after a successful mission to boost the power gridaboard the International Space Station (ISS). After one delayed attempt, Atlantis touched down in theCalifornia desert for a 3:49:38 p.m. EDT (1949:38 GMT) landing on a backuprunway at Edwards Air Force Base. “It’sgreat to be back on planet Earth right now,” Atlantis shuttle commanderRick Sturckow said after landing. Sturckow andhis STS-117 crewmates delivered a $367.3 million pair of trusses and new solar arrays to the space station’sstarboard side and stowed away an older solar wing atop the outpost duringtheir 14-day mission. “You gotto love that symmetrical space station,” pilot Lee Archambault saidduring the flight, which evened out the station’s previous off-kilter profile. The astronautsalso aided in the recovery of critical Russian computer systems aboard the ISS andswapped out one of the orbital laboratory’s three-person Expedition 15crew. Their four spacewalks included the repair of a torn thermal blanket -using surgical staples - on Atlantis’ left aft engine pod. Atlantis’landing ended a more than 5.7 million-mile (9.2 million-kilometer) trip and 219orbits around Earth for its STS-117 crew. The shuttle’s return came one daylate after persistent rain showers prevented Florida landings on Thursday andearlier today. Returning toEarth aboard Atlantis with Sturckow were shuttle pilot Lee Archambault andmission specialists Patrick Forrester, Steven Swanson, James Reilly II, DannyOlivas and SunitaWilliams, a former Expedition 15 flight engineer. Williams spentjust over 194 days in space - a world record for a female astronaut - and turned her ISSpost over to fellow NASA spaceflyerClayton Anderson during the STS-117 mission. “I hopeI can carry on and do half as well as she did on orbit,” said Anderson, whois due to return to Earth in October, before Williams left the station. After morethan six months in space, Williams said she’d miss the station and herExpedition 15 crewmates - commanderFyodor Yurchikhinand flight engineer Oleg Kotov- but was ready to return to her family and beloved dog Gorby. During hermission, Williams ran the Boston Marathon from orbit and exercised regularly inorder to cope with her return to Earth’s gravity today. She underwent an extra series of medical checkups after landing because of her long-duration flight, NASA said. 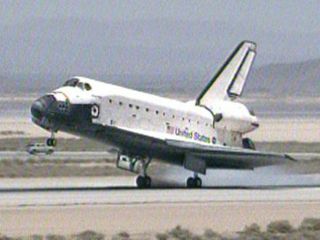 Today’s landing marked the 12th at Edwards Air Force Base for Atlantisand the spacecraft’s first since NASA’s STS-98 mission in 2001,when the orbiter delivered the U.S. Destiny module to the ISS. It isNASA’s 51st shuttle mission to land at Edwards Air Force Base. The lastshuttle to use the backup runway was Discovery, which touched down in August2005. “It’sa great place to land the shuttle,” Archambault said after landing. The successfulflight of Atlantis’ STS-117 crew primed the space station’s powergrid to support the addition of NASA’s new connecting node Harmony andthe European Space Agency’s Columbus laboratory, both of which are slatedto launch later this year. In addition toinstalling the new Starboard 3/Starboard 4 (S3/S4) trusses, STS-117 spacewalkersalso furled the sole remaining solar array extending from the station’smast-like Port 6 (P6) truss. Stowing that array brought P6 one step closertowards its eventual relocation to the station’s port-most end on a latershuttle flight, NASA said. “Ittruly is the first really permanent international human outpost inspace,” Reilly told reporters Wednesday of the station. “It’sour first real step off the planet." Michael Suffredini,NASA’s ISS program manager, said the mission also completed the deliveryand activation of intricate joints to rotate the station’s wing-likestarboard and port solar arrays. With the installation of the S3 segment, theMobile Transporter railway that allows the station’s robotic arm totraverse the length of the orbital laboratory’s metallic backbone-likemain truss is also complete, he added. NASA plans atleast 12 more shuttle missions to the ISS to complete the orbitallaboratory’s assembly, with two additional flights possible to delivercargo, equipment and other logistics. One non-ISS bound shuttle flight, setto launch in September 2008, is planned to overhaul the Hubble SpaceTelescope. Thursday’slanding completed NASA’s 118th shuttle mission - the 21st to the ISS -and the 28th spaceflight for Atlantis itself. The shuttle will now be preparedfor a jumbo jet ferry flight from California to KSC, a trip that typicallytakes between seven to 10 days and costs about $1.7 million, NASA officials said.